Hi everyone, Deanna here back with another Christmas in July project for your inspiration from Dies R Us. Here is what I have for you today. I started with a white card base cut and scored to make a 4 1/4" X 5 12" card base. I added a red mat cut at 4" X 5 1/4". Next I added a green patterned paper mat cut at 3 7/8" X 5 1/8". My Poinsettia Die is from the Poppystamps Holiday Poinsettia die. After die cutting my Poinsettia layers, I used an embossing mat to emboss each flower layer. That is what gives you the detail in the flower petals. The paper I used had a bit of shimmer to it. Before adhering the individual flower layers together, I used a pencil to slightly curl the leaves under to give the flower a more realistic look. I adhered the layers together using some liquid adhesive and then added the yellow flower center. Once the flower was assembled and dried I added it to my card. For my sentiment, I used the Poppystamps Old Fashioned Christmas die. This die is currently out of stock but there are several other Merry Christmas dies found here, here, and here. There are some wonderful holiday days in the newest release of Poppystamps and Memory Box dies. Be sure to check them out. If you haven't already done so be sure to sign up for the newsletter to be notified on new releases as well as other sales and special order dies. 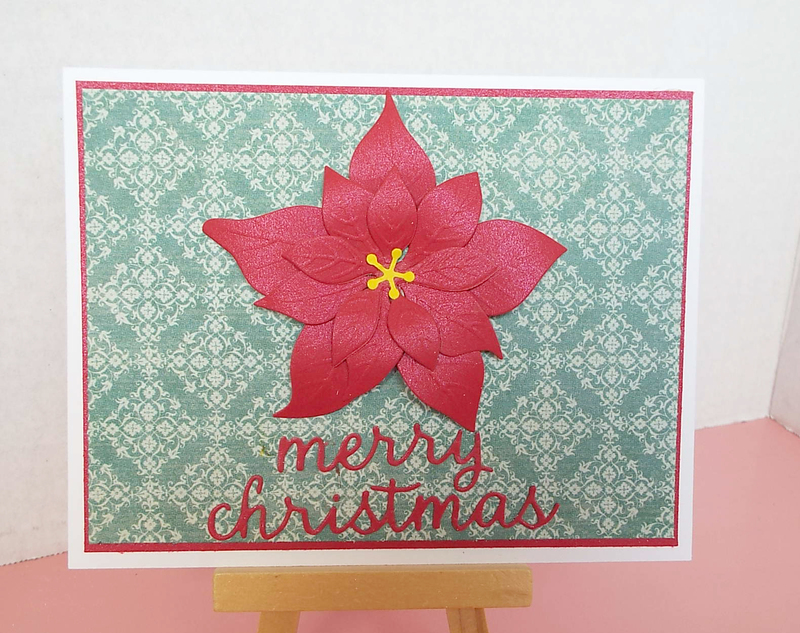 A fabulous poinsettia die, which really needs little else to show it off. Lovely Christmas card. Beautiful poinsettia CAS creation Deanna! Thanks for holiday inspiration! Pretty Poinsettia, looks great with that shimmer. so pretty, I just love the details in the petals and such pretty paper to go with it! Love your choice of poinsettia dies; this one is so realistic looking with just the right shape to the petals and all that detailed embossing. It made for a very beautiful card. Deanna, this is beautiful! I love the shimmery paper you used for the poinsettia. It really makes a stunning flower!